NuSource, LLC has been awarded a major contract to supply a safety related, ASME Code Section VIII Pall After-Filter housing and replacement filter cartridges. 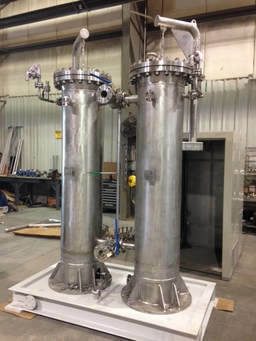 Through its exclusive partnership with Pall Corporation for nuclear aftermarket spares, NuSource will deliver these replacement items to a Boiling Water Reactor plant in the Midwest. The Control Air (NIAS) After-Filters are used to provide as reasonably as achievable “clean” air to the NAIS Control Air system to prevent fouling of the corresponding instrumentation and components. The scope of the project will include the design and manufacturing for a complete ASME Code Section VIII, safety related After-Filter housing with an additional follow on contract to provide safety related Air Filter Cartridges. NuSource will prepare safety related seismic and design calculations then will fabricate the housings at its Section VIII and III, Appendix B fabrication facility. The follow on contract will demonstrate NuSource’s capability to perform commercial grade dedication and testing. The cartridges will be dedicated and physically tested for flow at a specific test lab under guidance and control of the NuSource team.